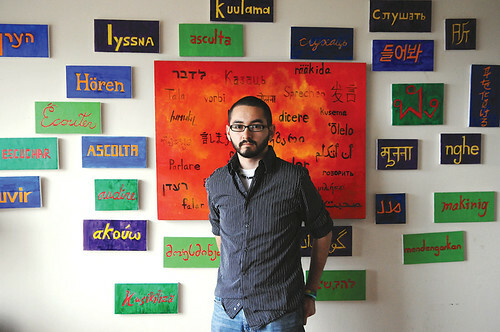 Ricardo De La Torre poses in front of his artwork in his home October 4, 2011. De La Torre came out to his family as a gay man in 2007, at the age of 17, after struggling with the decision and his religious and cultural background. Photo by Erik Verduzco. SF State art major Ricardo De La Torre always wanted to tell his parents about his sexuality, but other horror stories about coming out kept him postponing the date. As for De La Torre, it’s safe to say his own coming out story was not ideal. De La Torre was usually comfortable sharing information about his new life in San Francisco. He never thought any negative backlash would occur when he became open about his sexuality on Myspace several years back. Then in October of 2007 De La Torre found himself “outed” by a cousin who had come across his page and took it upon herself to inform De La Torre’s parents about their gay son. De La Torre was scared. He had heard all about Latino friends and their families’ reactions. He didn’t want to be kicked out of his home or to be treated differently by his parents. According to De La Torre, gender roles were given to him at a very early age. Men are expected to follow the rules of “machismo,” the Spanish term to describe masculinity, he said. De La Torre was raised to think that to be a homosexual man means to be a failed man because of the religious teachings he received growing up Catholic.